Locks, Hooks and Books: What IS Locker Hooking? Several years ago, I walked into a quilting store to purchase fabric. When I walked in, I came across a variety of items, some were the size a pot holder and others of a small rug. I have never seen anything like it and was intrigued. I asked the owner about them. He eagerly told me that they were done with the technique called Locker Hooking. And he even took the time to show me how to do it. I could not believe how quick and easy it was to do something so beautiful and unique. I was hooked.....locker hooked! So, "What IS Locker Hooking?" is a question I am asked about a LOT! 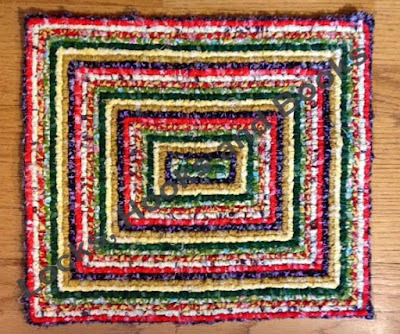 I have a hard time explaining what it is because it is a combination of many other needle arts: Latch Hook, Crochet, Cross Stitch, Rug Making, Quilt Making. 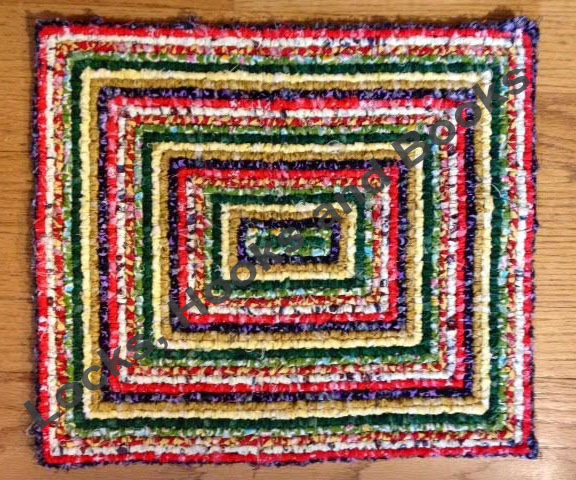 The canvas used is what is used in latch hook and rug making. The tool used is called a Locker Hook. It has a hook on one end that looks like one used in crocheting, while the other end has a large eye like that of a needle. Yarn, wool or strips of fabric (my favorite) is used to pull from the back of the canvas to the front. When pulling the yarn, wool, or fabric to the front, it makes a loop like many would make in other needle crafts. These loops are locked in by a continuing piece of twine. Patterns can be used or could easy be created by using squares like in cross stitch. Really, a pattern doesn't even need to be used. Just use whatever strips on hand and go! The finished projects are sturdy enough for washing and can be used for years! This is one of my first pieces when I was learning to locker hook. No pattern was used, just strips of fabric that I had on hand. It is 13 in x 15 in and only took a couple of hours to make. The possibilities is endless on what you can do with locker hooking. I have made rugs, wall hangings, coasters, hot pads, potholders, pillows, and even Christmas ornaments. A few pieces I made were made by using clothing, bed linens and curtains that belonged to beloved family members who had passed away. Which were great gifts to others in the family. I have enjoyed creating my own designs, including using actually photographs to make those designs. Has anyone else ever heard of locker hooking before? What do you think of it?